The Birmingham Post has published an excellent response to the claims from Councillor Deirdre Alden that cycling is in some way discriminatory. It’s worth reading in full, despite the headline about ‘sport’, which presumably has been added by a sub-editor. 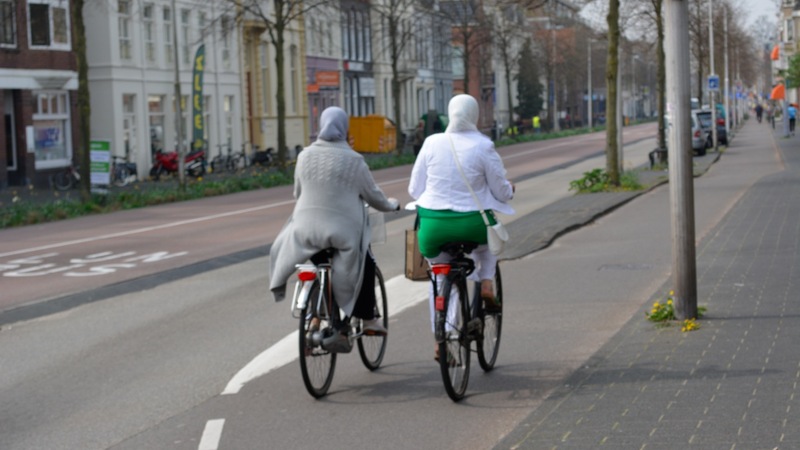 It might be great for cyclists but it won’t be great for the rest of the population, particularly elderly people, a lot of women who don’t cycle, a lot of disabled people who can’t cycle, a lot of the ethnic minority people – do you see them cycling all over the city in their hijabs? It isn’t sensible policy. It’s highly discriminatory for relatively few people who don’t pay any money, who don’t insure, and I do think we do need to get away from the pretence that cycling is wonderful for everybody. Loads of pedestrians will be put at greater risk. 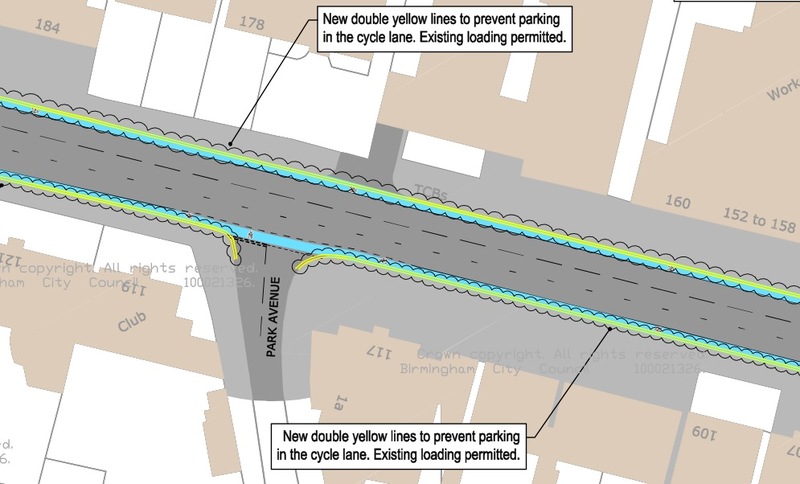 If there genuinely were ‘hordes’ of people cycling on Birmingham’s enormous roads, that would not have a negative impact on motorists (let alone a ‘severe’ impact) – it would be a positive one, because it would reduce the lengths of queues, and congestion more generally. Cyclists don’t come out of nowhere – they’re just people who would have been making trips by other modes. The vast majority of cyclists on our roads are young, white men… most elderly people are not going to cycle, and it would be dangerous for them to start on our streets now. In asking for the assessment, I made the factual observation that most, not all, but most, of the cyclists I see in my area are young white men. Of course I know some elderly, disabled, women and people from all ethnic groups cycle. But clearly many in Birmingham – for lots of reasons – don’t feel they can. Surely it would be better to spend some of the cycling money in ways which would help those groups who don’t currently choose to cycle? None of the £24 million is being spent on lighting the canal tow path which would enable safer cycling. It is all being spent on the road and this can put cyclists off. It is only helping current, confident cyclists – not new cyclists and all sections of society. There is a scheme in a local Edgbaston park that is encouraging Asian women to cycle which is great but we’re talking about roads here. Now I have to say here that Alden is actually making a sound argument. If the improvements being made to the roads are only marginal, then I think she is right to say that the money is being spent in a way that could be discriminatory. If the funding, for instance, is being spent making cycle lanes a bit wider, or painting ASLs, or other measures that are not at all attractive to children, or the elderly, or those with disabilities, then yes, the only people benefiting will be those who are cycling already, who are disproportionately male and middle-aged. This is on the A41 Soho Road. Does this look like an environment in which some painted symbols in the carriageway will make cycling attractive to all? 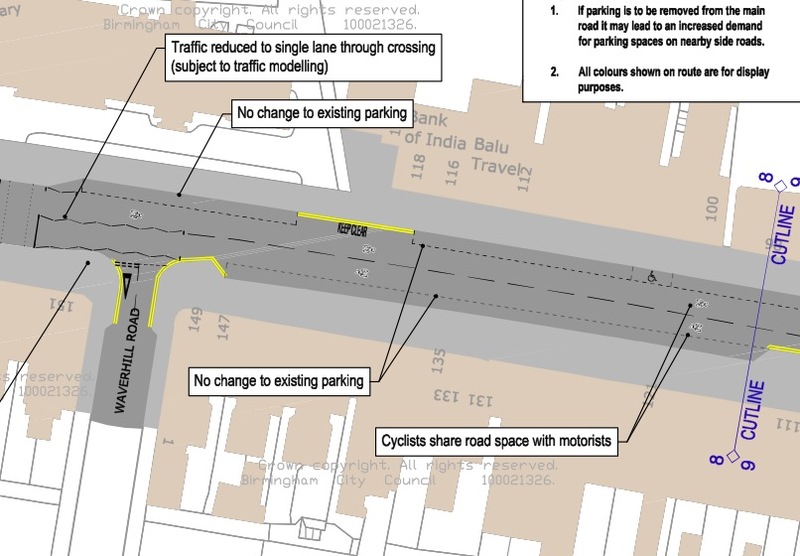 Elsewhere we have a cycle lane alongside a dual carriageway, with loading allowed in the cycle lane. 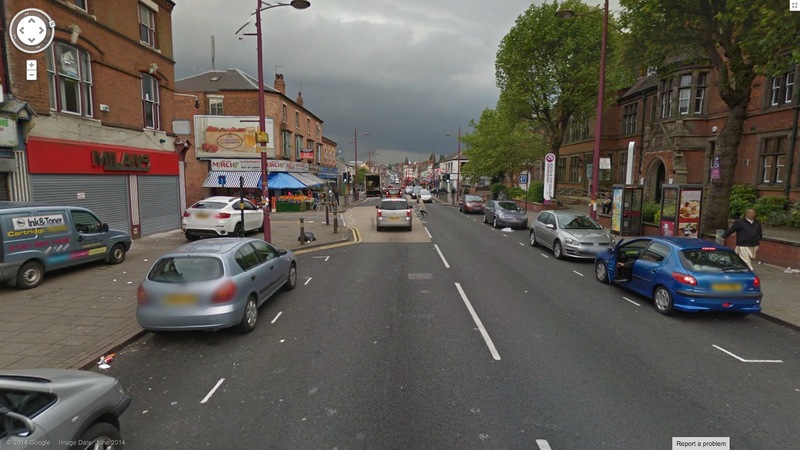 So, while there are better parts to these proposals, some of the money Birmingham has won from the Department for Transport would seem to be being spent on schemes that are not inclusive – ‘only helping current, confident cyclists’, as Alden puts it. Whether these arguments are being made in good faith or not is hard to say; the picture is muddied by her comments about cycling being something that certain groups of society simply won’t engage in, regardless of the quality of the environment. Cllr Hutchings’ comments fall more overtly into this category; that ‘cyclists’ are a small subset of the population – compared to ‘the rest of the population’ – who don’t deserve any money. What can be said is that cycling is only as discriminatory as we make it. The reason why cycling is limited to certain groups, in certain places and along certain roads, is because the environment excludes others. Riding a bike – or using pedal power more generally – is something that nearly everyone can engage in, if the environment is right. Even those who don’t cycle, and use mobility scooters and wheelchairs to get about, would benefit from a quality cycling environment. So while it is true to say that cycling is a mode of transport that many people are excluded from using in cities like Birmingham, that in itself is plainly not an argument for maintaining the status quo. 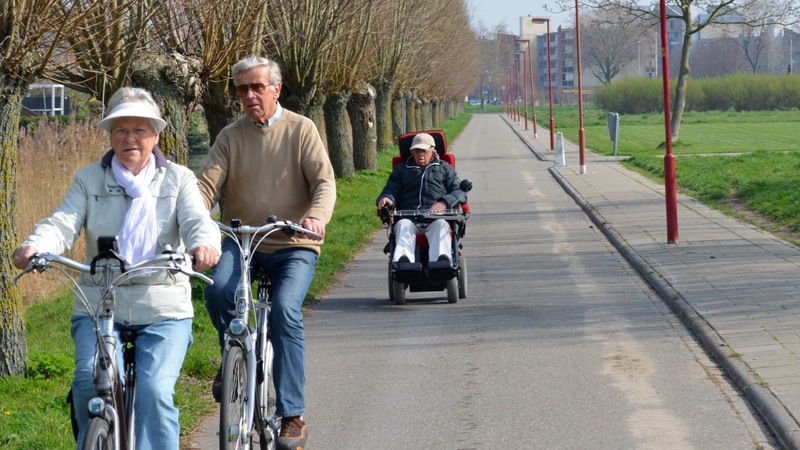 If children and the elderly do not feel comfortable cycling on dangerous roads, then rather than shrugging our shoulders and doing nothing, while wailing about how cycling is ‘discriminatory’, that state of affairs should be remedied. BUT we need changes to roads and streets that open them up to all potential bicycle users, not marginal adjustments that make things slightly better for the few currently willing to cycle on them. Buried in the rhetoric from those councillors in Birmingham is a substantive argument. Well put, I only wish that this message could get as far as the original article generated by people who clearly don’t have a clue what they are talking about, has done. 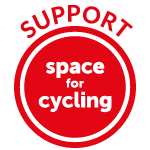 I’ve just sent an email to my local shape your place web site, run by the local authority where we lived in the UK telling them how great it is now to cycle where we now live in Utrecht. Cambridgeshire failed to provide my kids with a safe route to school without the daily encounter with HGV’s and impossible-to-cross busy roads, so we have moved to Holland. The UK really has to get it through it’s thick skull that infra is the key to universal mobility and that our transport network is the one doing the discriminating. I think the classification under “sport” is very telling. The UK desperately needs to uncouple utility cycling and sports cycling in both language and provision, and not base one on the other. I do feel that the Councillors (and others) need to be put on the spot and asked to explan how they propose to end the discrimination on the roads, since that is what they still appear to be condoning. Councillor James Hutchings sounds like David Brent trying to hide his ignorant racism behind a thin veneer of political correctness – “the ethnics, with their hijabs…” – and I suspect he had to stop himself from saying “wheelchair people” too! Reading this argument against cycling infrastructure reminds me of my childhood, much of which was spent getting around by bus or train because my mother didn’t have a driving licence. Those buses and trains were extremely discriminatory forms of transport- slam-door carriages and step-entrance buses were not the friends of wheelchair users or anyone else with limited mobility, parents with buggies, or anyone carrying awkward luggage. What makes the public transport of today a lot easier and more accessible than that of my youth- and I’m under thirty so this is a very recent change- is that the right kinds of legislation and investment were put in place to make sure that low-floor buses, raised bus stop kerbs, and wide, automatic train carriage doors became the norm. I agree that the councillors’ objections have valid roots but if people like this had their way rather than low-floor buses we’d have abolished bus routes to make way for more cars. 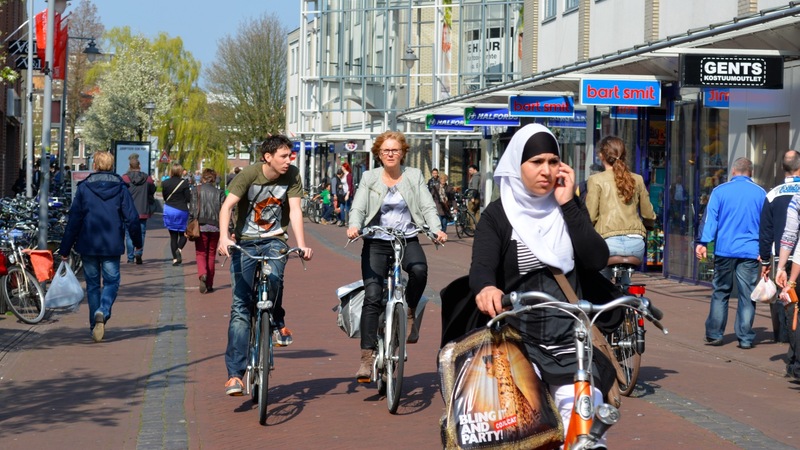 The pictures from Holland show you don’t have to be white at all to ride a bike. Just a few days ago I passed a couple of elderly Moroccan men, dressed in their traditional clothes while riding a omafiets. Given the right circumstances, everybody can and will use the bicycle. I don’t think it’s that hard to say. Cllr Deirdre Alden was proposing that investment for cyclists should be done on tow paths, so her aim is to get cyclists off the roads, and into shared use schemes rather than proper cycling infrastructure. Meanwhile Cllr John Alden (relation?) argued cyclists should be licensed and insured like motorists are if they wished to use the road. Another way of seeing it is that even the crappy cycling infrastructure that was being proposed was seen as too much by them.